The first figure now claims attention. His body, etc., is copper-coloured, and his skirt has a yellow waistband. His shirt is black and pale green, his hair being black. The goat is of a light brown colour, with a black horn. The second figure has copper-coloured limbs and face, black hair, and a bright blue garment. The pipe is black, with a scarlet centre, the bird being pale green, with a brown wing and black beak. The bottle is a reddish brown and the flag black. The work is all done in pieces of cotton material, sateen being used, with the dull side uppermost, pieces of linen, or plain lining of every description being cut out to shape, the edges turned in, and sewn on roughly, one piece upon the other. Fine work must not be put in, or the effect will be lost. Of course, as far as possible, the sewing cotton must match the material in colour. The eyes are worked in with soft, white darning cotton, with a thick black cotton pupil, and the legs of the birds in thick black cotton. The whole is bound all round with bright blue, and is most effective when finished. The next piece of patchwork to be described is not so rough in its design. It is intended for a chair-back, and is worked on a strong, unbleached calico. 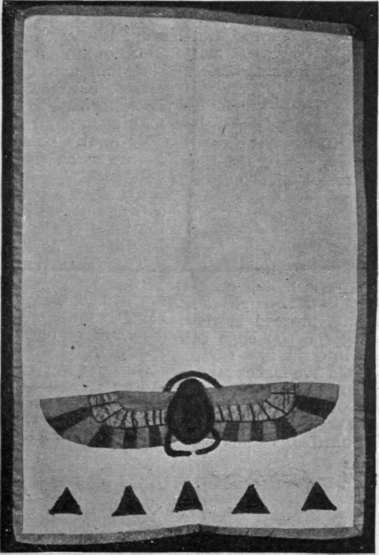 As will be seen, it represents an Egyptian scarab. The lower portion is worked in alternate patches of dull blue and green. The centre is bright emerald-green, divided up with lines of black outlining, and the top strip of the same dull blue as used below. The body of the beetle is scarlet, outlined with black bands, black legs, and an arched black piece at the top of the head. The pyramids at the edge of the work are scarlet, with black lines worked across each one. The binding all round the edge is of the dull blue. The chair-back would be suitable for a dining-room, smoke-room, or for a man's room at college, as there is nothing effeminate in its appearance. 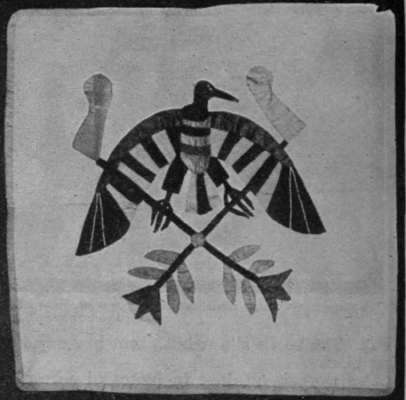 The third piece of work was intended for a cushion square, and shows a strange-looking bird of brilliant colouring standing on two crossed bars, each bearing a floral tribute at the bottom and a pennant at the top. The bird's head and its top wings are of a purple-brown, the beak is also brown; the lower parts of the wings are of alternate red and blue, the end pieces being in black, with two stripes up the centre worked with coarse white thread. The body is of pale green with a black stripe across the top, and a yellow one beneath; the tail is red and blue, and the legs are black, the claws brown. The cross-pieces are worked in black material with pale green pennants, a green round in the centre, the lotus flowers being in brown with a yellow centre on a pale blue background. The bird is no doubt symbolical, and, together with the other designs given, is copied from some work brought direct from Cairo. Egyptian patchwork opens out a wide field, especially to those who live in London, for a visit to the mummy-room at the British Museum would repay the worker with some delightful designs, the frescoes round the rooms and the mummy cases showing pictures, that could be easily copied. The best plan is to draw the design on a piece of brown paper, and decide upon the colours to be used. Each separate piece of the design should then be traced and cut out to serve as a pattern, and the material cut out by it, allowing sufficient turning to neaten all round. When each part of the design has been cut out, the picture is built up, tacking one portion over the other, and hemming all round quite roughly. To the fine worker this seems tiresome at first, but good, fine needlework is out of place. As the material has the advantage of washing well, there are many ways in which it can be adapted to Western uses. It would make quaint curtain borderings and rugs, garden cushions, and wall-hangings, especially the latter, if made in long strips after the fashion of the Japanese kakemonos, and hung on wooden rollers. Very correct drawing is by no means necessary, and no two pieces are quite alike. It sometimes saves time when working designs that pair, like the dog and the birds, to cut them out together. One of the dogs given in the strip, however, is considerably shorter than the other. A fairly straight line must be kept at the bottom of the design, or the work will appear crooked.